Scrubbing and cleaning enameled cookware has traditionally been a delicate procedure; the right amount of pressure and non-scratching material must be used. Now, using Goodbye Detergent's cleaning Enamelpad, the process has never been easier. These two pads are designed specifically for use on enamel, and are perfect for removing minor stains and general cleaning and polishing with their scrubbing side and sponge side. Both are made from pumice stones and non-woven polyurethane to reduce impact on the environment. Because these cleaning pads are meant to be used without detergents and harsh chemicals, they not only help you save money, but help the environment at the same time. Please note: Enamel pad sold as set of two. 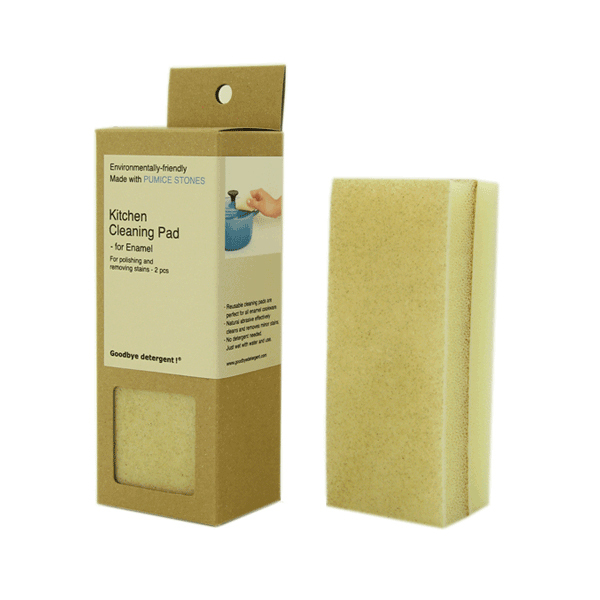 Kitchen Cleaning Enamel pad - Made with Pumice Stone, Non-woven Nylon and Polyurethane. Removing minor stains from enamel cookware, other side is for general cleaning & polishing.